Contrast-Induced Nephropathy (CIN) is a form of Acute Renal Failure that is caused by exposure to contrast media during image-guided cardiology and radiology procedures. Two investigator-sponsored European studies have demonstrated RenalGuard's effectiveness at preventing CIN. Reprieve Cardiovascular’s Guided Diuretic Therapy, using RenalGuard technology, is designed to manage fluids during diuretic therapy for patients with Acute Decompensated Heart Failure (ADHF), and may relieve a number of symptoms related to ADHF. Acute kidney injury (AKI) is reported in up to 30% of patients undergoing cardiac surgery and is a recognized independent predictor of both morbidity and mortality. RenalGuard Therapy may reduce this incidence. RenalGuard® is designed to protect patients from procedure-induced acute kidney injury (AKI) which may result from contrast, cardiac surgery, and heart failure. The technology was initially designed to reduce the toxic effects that contrast media can have on the kidneys, which may lead to a reduction in the incidence of Contrast-Induced Nephropathy (CIN) in at-risk patients. 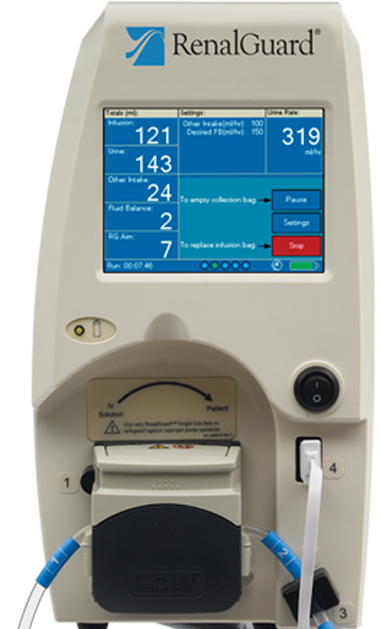 The device is CE-marked for sale in Europe and a variety of countries throughout the world, and is under investigation in the U.S.
RenalGuard is CE-marked for the intended use of temporary (up to 14 days) replacement of urine output by infusion of a matched volume of sterile replacement solution to maintain a patient’s intravascular fluid volume. The RenalGuard System is not intended for infusion of blood, blood components, medications, or nutritional fluids. All treatments administered via The RenalGuard System must be prescribed by a physician. RenalGuard Solutions, Inc. reserves the right to modify the specifications and features described herein, or discontinue manufacture of the product described at any time without prior notice or obligation. Caution - Investigational Device, Limited By United States Law to Investigational Use. This site contains medical information that is not meant to substitute for the advice provided by a medical professional. Always consult a physician if you have health concerns.